Often we come across certain instances where we are stunned by the similarities between animals and humans. Especially, dogs have a certain bond with humans that cannot be explained. Dogs kind of imitate whatever humans do. Humans, though follow different faith, worship their gods and be devoted to them. But when dogs enter temple, they are often shooed away. Luckily, this dog in the Pune temple didn’t face the same fate. This adorable stray dog is welcomed by the devotees to sing bhajans along with them. 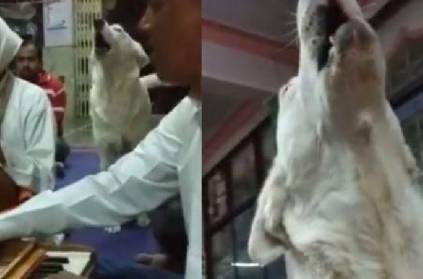 A Twitter user shared the video of the dog singing along with the devotees and soon the video went viral as people started gushing over the dog. The post has garnered over 5000 likes and over 2000 retweets. ஐயோ!...தெரியாம செஞ்சிட்டோம்...'தாய் சிறுத்தை பழிவாங்க வருமா'?...மரண பீதியில் கிராமம்! ஆஞ்சநேயருக்கு துளசிமாலை சாத்திவிட்டு திரும்பிய அர்ச்சகருக்கு நடந்த விபரீதம்! சபரிமலையில் தரிசனம் செய்த சசிகலா.. ‘எனக்கு கர்ப்பப்பை கூட இல்லை’ என உருக்கம்! This page contains news relating to various facts and events. The views are generally about current affiars and general topics in diversified areas such as political, international, national, and regional issues, sports, health, travel, lifestyle, technology and business. People having similar interets on the above topics will find this page useful. Viral video Stray dog sings “bhajans” along with devotees in temple | Fun Facts News.